A £5m fund to celebrate next year's centenary of the first British women to get the vote, has been unveiled by Chancellor Philip Hammond in the Budget. The announcement coincides with International Women's Day. The fund will support projects to mark the passing of the 1918 Representation of the People Act and "remind us all just how important it was." But Labour said women are still having to fight for "economic equality". The Act of 1918 gave some women the vote for the first time and paved the way for the introduction of universal suffrage 10 years later, which saw women win equal voting rights to men. Mr Hammond said: "It was the decisive step in the political emancipation of women in this country and this money will go to projects to mark its significance and remind us all just how important it was." He said the money would help educate younger people about the significance of the suffrage movement. Meanwhile, thousands of women are expected to gather in London to campaign about their pensions. They want the government to implement fairer arrangements for women - born in the 1950s - who they say have had up to six years added to their pension age with little or no notice. The government maintains the decision was made more than 20 years ago for equality. Shadow equalities secretary Sarah Champion said: "It's right that we mark and celebrate the achievements of so many women who risked their homes, families and freedom to fight for democracy and economic equality." "However, 99 years later, women are still having to fight for economic equality under this Tory government," she added. "From cuts to universal credit and 54,000 women losing their jobs through maternity discrimination, to the treatment of thousands of women born in the 1950s who have been left with a crisis in their retirement planning, this government is systematically turning back the clock on gender economic equality." And writing on Twitter, leader of the Women's Equality Party, Sophie Walker, said: "£5m for women's festivals? I'd rather equal pay, job opportunities, political representation and no [violence against women and girls] ". The Women's Budget group - an independent, not-for-profit organisation monitoring the impact of government policies on men and women - suggested the £5m could be used "to analyse (the) impact of (the) budget on women". But Sam Smethers, chief executive of women's rights charity the Fawcett Society, welcomed the funding. She said: "We need to ensure young women and men know their suffrage history and the relevance of that struggle to tackling discrimination, harassment, and inequality that women and girls experience today." Women had argued for - and won - new rights in the 19th Century. But without the vote, campaigners believed there was little incentive for politicians to improve the lot of women further. Organised campaigns for women's suffrage began to appear in 1866 and from 1888 women could vote in many local council elections. When parliamentary reform was being debated in 1867, John Stuart Mill proposed an amendment that would have given the vote to women on the same terms as men but it was rejected by 194 votes to 73. After this, the campaign gained momentum. The movement to gain votes for women had two arms: the suffragists and the suffragettes. In 1897, the National Union of Women's Suffrage Societies was formed under the leadership of Millicent Fawcett. The NUWSS wanted the vote for middle class property-owning women. They used peaceful tactics to campaign - non-violent demonstrations, petitions and the lobbying of MPs. 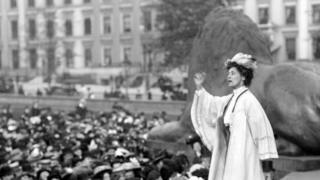 Born out of the suffragist movement, came the suffragettes led by Emmeline Pankhurst. Their name was courtesy of the Daily Mail newspaper, which coined the term "suffragette" as a derogatory label for the more radical and militant members of the women's suffrage movement. In 1903 Mrs Pankhurst decided to break with the NUWSS and set up a separate society, to include younger and working class women. This became known as the Women's Social and Political Union (WSPU). Their motto was "deeds not words" and violence, hunger strikes and law-breaking became part of their campaign tactics. In 1918 the Representation of the People Act extended the vote to all men over 21, and to some groups of women over 30. Yet more than half of women still did not have a say in electing their government. Campaigning would continue until 1928 when women were finally granted the vote on equal terms to men.